Gerry Cariou is the Executive Director of Ontario's Sunset Country. It's part of every Canadian's heritage - the wilderness areas where few if any people live - are something that almost all Canadians are proud of. While our country is known best for hockey, it's our wilderness that really defines what it means to be Canadian. With one of the largest, contiguous stretches of Boreal Forest on the planet, we do wilderness right up here! In Sunset Country, of the almost all 100,000 square kilometers our region covers, virtually all of it is Boreal Forest, with its lake-studded landscapes and rugged rock outcrops, we offer some of North America's best destinations for any nature lover. And nowhere else is this wilderness more pristine than in the protected boundaries of our wilderness Provincial Parks. This image shows all that the Boreal has to offer - water, sky, pine trees, rock outcrops and a beautiful sunset! This is an overview of the top three wilderness-class Provincial Parks located in the Sunset Country Travel Region. Please note this does not include developed parks such as Blue Lake or Rushing River - they offer a different visitor experience. It also does not cover other, more remote wilderness parks in our region. To learn more about the other parks go here. To learn more about paddling in Ontario go here. A place for paddling would be one way to describe Woodland Caribou Park. With almost 2,000 kilometers of canoe routes, you could canoe or kayak here for years and get only a glimpse of what the park has to offer. Two major river systems - The Bloodvein and Gammon - run through the park and the Bloodvein is also a designated Canadian Heritage River. You won't have a problem finding good campsites along the way either. Most people who access Woodland Caribou do so out of the community of Red Lake. Fishing in the park is nothing short of spectacular with lake trout, northern pike, and walleye in large numbers and some of the lakes even offer bass and muskie. In addition to the fantastic paddling opportunities available, Woodland Caribou Park has a number of lakes with fly-in outpost cabins for anglers. No canoe required as you'll be accessing the cabin and your own lake by bush plane. Fewer than 1,000 people visit the park each year so it is truly a "wilderness" park where you can experience the Boreal Forest in its true splendor. Learn more about Woodland Caribou Provincial Park here. 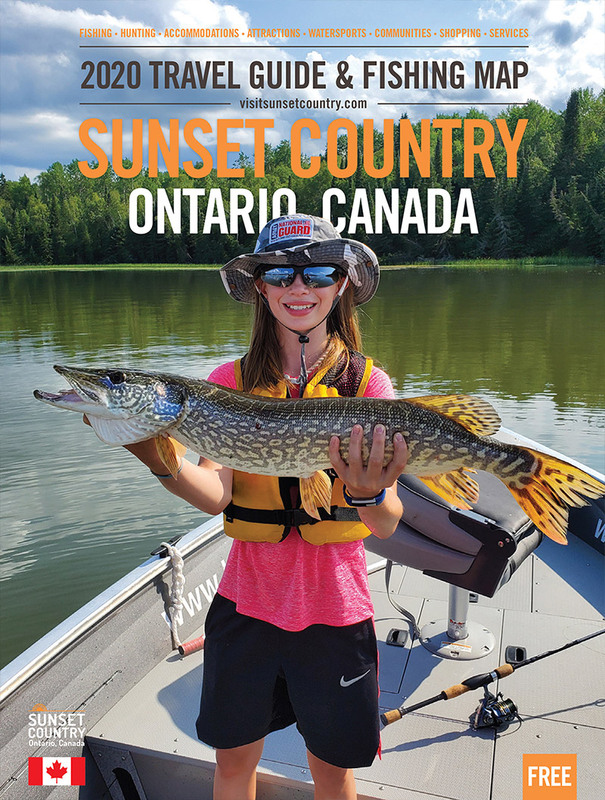 Connect with the Sunset Country outfitters operating in Woodland Caribou Park here. Location	The Park is located north of Kenora and West of Red Lake, Ontario. It borders the Province of Manitoba on the West. Operating Season	Open all year. Park Area	The park covers an area of 470,000 hectares or roughly 1.3 million acres. Fish species	Catch lake trout, walleye and northern pike. Smallmouth bass and even muskie are available in select lakes in the park. Did You Know... The woodland caribou the park is named after are an at-risk species in Ontario and fully-protected. Located just south of the Town of Atikokan and created in 1913, Quetico Provincial Park is one of the oldest in Ontario yet the interior at least, still stands the "wilderness" test after all these years. At 1.2 million acres, there's lots of wilderness too! The interior of the park is a visual jewel, with towering white pines, massive cliffs along the waterways and many waterfalls. It is a canoeists paradise and there are several capable canoe outfitters able to set you up on a trip into the park. There are literally hundreds of available campsites along the many canoe routes and the fishing is simply out of this world. Catch bass, trout, pike, and walleye anytime of the day and boy, there are some big fish swimming in the lakes inside Quetico. Quetico is more developed than most other wilderness parks as there is a drive-in campground at Dawson Trail and you can even rent a cabin at the campground year-round. In winter, the cross-country ski trails are beyond fantastic! Quetico borders the Minnesota Boundary Waters Canoe Area in the USA yet offers a more realistic wilderness experience given access to Quetico is based on issued-permits only. Quetico is staffed and has a number of special events throughout the year. Apply for your park permit early to avoid disappointment. Learn more about Quetico Park here. Locate Sunset Country members operating in Quetico Park here. Location	Quetico Provincial Park is located south of the Town of Atikokan and borders the BWCA in Minnesota. Operating Season	Lucky you, Quetico Park is open to visitors year-round! Park Area	Quetico Park is huge covering an area of about 460,000 hectares (1.2 million acres) and the park has over 2,000 lakes! Fish Species	The lakes in Quetico are teeming with fish including walleye, smallmouth bass, lake trout and northern pike. Did You Know...	Quetico offers drive-in family camping at the Dawson Trail Campground with facilities for all types of camping equipment and 35 km of hiking trails! The best way to see Quetico is by canoe! One of the largest parks in Ontario and Canada, Wabakimi Provincial Park is located NNW of Thunder Bay and just east of Pickle Lake. At 892,000 hectares or 2.2 million acres, there's lots of room to roam - including 2,000 kilometers of canoe routes in the park. To give you some idea as to just how big Wabakimi is, consider that it covers more land area than the States of Delaware and Rhode Island combined and is not much smaller than the State of Connecticut! The park's name of Wabakimi is derived from the Ojibway words Waubishkaugimi (meaning “whitewater”) or Wabishkkegin (meaning “the sheet is white”). Whitewater Lake is one of the largest in the park and offers spectacular fishing. Most visitors go into the park on a canoe trip or fly-in to stay at several remote lodges and outpost cabins. The fishing for walleye and northern pike is beyond belief and you have a good chance at landing a monster fish in many of Wabakimi's freshwater lakes. In addition to fishing, hunting is also open during the Fall season with giant moose the main quarry sought after by hunters. The park is rich in all kinds of wildlife so any visitor should ensure they have lots of room on their memory card as picture opportunities will present themselves everywhere. Learn more about Wabakimi Park here. Connect with Sunset Country members operating in Wabakimi here. Fish Species Available	Walleye and northern pike are dominant but some lakes yield lake trout, brook trout and smallmouth bass. Did You Know...	You can access Wabakimi Park via train - the only park in Sunset Country where you can do this. This article provided you with a brief glimpse into only the top three of our dozen or so wilderness-class parks in the Sunset Country Travel Region. Whether you visit one of these parks or go somewhere else in the region, you won't be disappointed. Paddlers will find a combination of comfortable flat-water sections along with some rapids you can run if you're the more adventurous type. Anglers can access remote outpost cabins or full-service lodges in Woodland Caribou and Wabakimi, as well as in some of our other wilderness parks. The fishing is truly incredible, we can guarantee you won't be disappointed! But for those who love the outdoors and yearn in their hearts to see what it might have looked like "before people arrived", then a trip into one of these jewels is exactly what you're looking for. See woods untouched by logging, lakes fished at most a dozen times per year, wildlife that seems to be around every bend in the course you're taking - this is an authentic wilderness experience that cannot be easily matched. Again, don't forget your camera, you'll be using it a lot more than you thought. Don't forget to get your free travel guide and map! Gerry Cariou has been Executive Director of Ontario's Sunset Country Travel Association since March of 1999. Gerry is an avid outdoorsman, nature photographer and angler, fishing many of the lakes in the region. Gerry is the architect of Sunset Country marketing efforts and regularly speaks with travelers over the phone, on-line and at the sport shows. He lives in Kenora, Ontario.